Ezra malayalam movie is scheduled to release on 10th february 2017 and it’s satellite rights sold to amrita tv. we have posted about aby movie rights here, surya tv bagged the rights of aby movie . It’s a horror subject and it’s teaser, trailer already watched record views. This is the first movie of prithviraj in 2017, It’s release post pond due to theater strike. 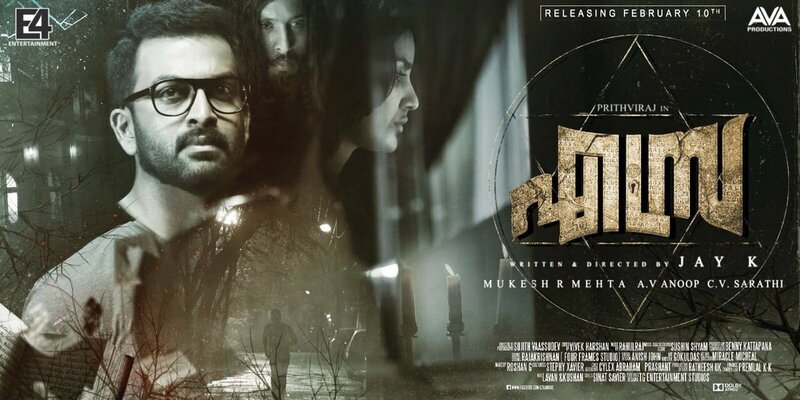 Jay K is the director and writer of this malayalam horror movie. Prithviraj Sukumaran, Tovino Thomas, Priya Anand, Sudev Nair, Babu Antony, Sujith Shankar, Vijayaraghavan, Ann Sheethal are in the star cast. Produced by Mukesh M Mehta, C V Sarathy, A V Anoop under the banner of E4 Entertainment & AVA Productions. This film release date changed and finally releasing on 10th february 2017. Cinematography done by Sujith Vasudev, Music composed by Rahul Raj and Sushin Shyam, Background Score done by Sushin Shyam, Edited by Vivek Harshan. This movie telling the story of newly married couple Ranjan and Priya. Prithviraj is the playing the role of Ranjan, Priya Anand doing the female lead role. Tovino Thomas playing the role of A. C. P. Shafeer Ahammed in this film. Amrita tv started purchasing films after a short gap, Valliyum thetti pulliyum thetti was the last one. They are planning to start more programs and shows. Aliyan vs aliyan, Oru cilma kadha etc are some of the new shows. This movie released with positive reviews from all. We can very soon expect the premier show of the film on Amrita TV.